To some, it may seem that using crystals to help realign our energies and our bodies is magical hocus pocus. The reality of it though is more than that. Essentially crystals parts of the earth that are millions of years old, forged during the earliest parts of earth’s formation. They are the most organized structure that exists in nature, meaning they have the lowest amount of entropy (a measurement for disorder). 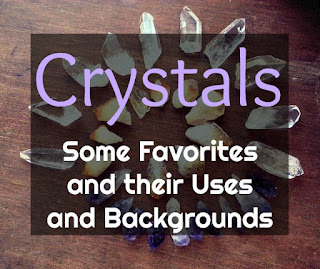 Crystals are structured in such a way that they respond and react to the inputs of all different energies around them, leading them to oscillate and emit specific vibratory frequencies. Because the crystal lattice within the gem is so balanced and orderly, the energy it emits is consistent, and when dissonant energy is inputted, it is balanced and transformed into a harmonic energy. The cells in the human body also vibrate at certain frequencies, as do the chakras (the centers of the human energy body). So when we come into contact with a crystal, its vibration interacts with the vibration of the cells in our body and turns negative vibrations into positive ones. Over millennia many civilizations, and especially royalty, have used gems and crystals for their healing energies. It is believed that in some ways this is credited for how the usage of jewelry began, with the placement of crystals on the crown on a royal’s head to activate their crown chakra, and the same goes for a necklace over the heart chakra, rings on fingers for energy meridians, and earrings to stimulate reflex points. Egyptians used such stones as did the Greeks and peoples in India and China. Here in North America, many of the indigenous tribes used in their traditional jewelry such stones thought to contain healing powers, including Agate, Turquoise, Onyx and more. Some of my favorite crystals that I use, some of them daily, are Australian Bloodstone, Labradorite, and Blue Sandstone. Labradorite is a member of the Feldspar family and is treasured for its remarkable play of color, known as labradorescence. The stone, usually gray-green, dark gray, black or grayish-white, is composed in aggregate layers that refract light as iridescent flashes of peacock blue, gold, pale green, or coppery red. Lore of the Inuit peoples in Alaska claim Labradorite fell from the frozen fire of the Aurora Borealis, an ordinary stone that transforms to the extraordinary, shimmering in a mystical light that separates the waking world from unseen realms. This is a stone that tempers the negative side of our personality, the traits, and actions that rob our energy and may produce depression or shame. It is said to be a crystal of shamans, diviners, healers, and all who travel and embrace the universe seeking knowledge and guidance. For self-discovery, it is excellent for awakening one's own awareness of inner spirit, intuition, and psychic abilities. Bloodstone (or the Australian variety like mine) may be classified as a Jasper or Chalcedony variety of Quartz and is usually a combination of the two. It is typically defined as a dark green Chalcedony with blood-like spots of Red Jasper or iron oxide inclusions. Called the Sun Stone, and later Christ’s Stone, its energy carries the purity of blood and inherently speaks of life and birth, vitality and strength, passion and courage. As a talisman, it is both mystical and magical, and its virtues are protective and nurturing. I use it most during the times I set aside for meditation as it is a marvelous aid and meditation and prayer, bringing a calm, harmonious energy, beneficial for grounding and centering. I hope that you enjoyed learning a little about crystals, their uses, and background. There is so much more to learn on this subject, I was able to learn quite a bit of new information during my research.